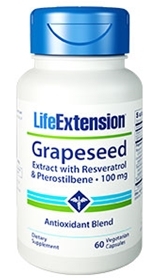 The Grapeseed Extract with Resveratrol formula provides a concentrated blend of standardized proanthocyanidins found in grapeseed and skins. The proanthocyanidins and flavonoids in this formula are rapidly absorbed and distributed throughout the body, helping to eliminate free radicals while promoting healthy collagen formation. Grapeseed extract helps to maintain healthy platelet function and other aspects of platelet responses, and protects the central nervous system from reactive oxygen species. This whole grape extract contains a spectrum of polyphenols that are naturally contained in red wine such as proanthocyanidins, anthocyanins, flavonoids, etc. This product contains NO milk, egg, fish, peanuts, crustacean shellfish (lobster, crab, shrimp), soybeans, tree nuts, wheat, yeast, gluten, or corn. Contains NO sugar, artificial sweeteners, flavors, colors, or preservatives. 2- Masquelier’s is a registered trademark of International Nutrition Company BV (INC), Loosdrecht, The Netherlands. 3- Leucoselect is a registered trademark of Indena USA. US Reg. No. 2294439. *Same Material As Research Trials. Pterospan (Pure Pterostilbene) and SMART are trademarks of Pharma Science Nutrients, Inc., and are used here under license. All rights reserved worldwide.